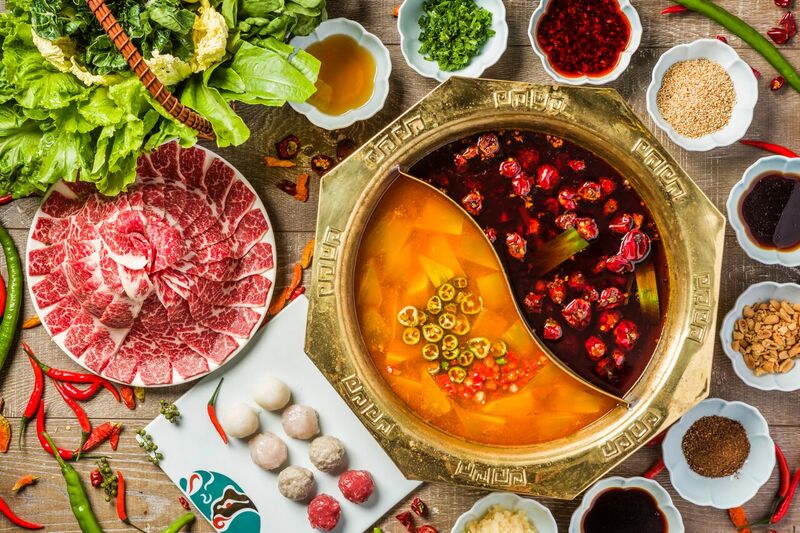 If the phrase “food brings people together” was embodied in a real-life paradigm, the most befitting meal would be none other than the hot pot experience. A group of hungry folks hovering over a bubbling pot of fragrant broth, cooking slices of meat and simmering fresh seafood and vegetables, is quite the belly-warming scene — it’s the epitome of communal dining. From hidden gems in less-explored Tai Kok Tsui to Michelin-recognised restaurants, we bring you our recommendations of the best hot pot spots for your next group outing. A hidden gem tucked away in the alleys of Tai Kok Tsui, Choi Kee represents one of the rawest forms of carefree hot pot dining in Hong Kong. It’s a late-night joint that grows more lively as the night progresses; diners flood in after 10pm for their signature seafood items: the freshest Pacific oysters, Manila clams, Japanese eel, Alaskan crab and, of course, geoduck and sea urchin (to be devoured sashimi style), which cannot be missed. Don’t forget the handmade shrimp or squid paste that you’ll definitely want to get a taste of. Tip: Dip your chopsticks in the hot soup before scraping the paste into the pot, as the meat has a thick consistency that isn’t the easiest to handle for hot pot beginners. Originating from Beijing, Dong Lai Shun has become a local hot spot for Hongkongers looking for high-quality hot pot. A paradise for lamb lovers, it’s highly praised for its extensive mutton selection, which comes in the form of paper-thin slices, rolls, chunks, dumplings and meatballs. There are over 15 soup bases to choose from; we recommend a light, silky chicken and fresh coconut broth to bring out the flavour of the ingredients without overpowering the meat. One must-order item from the menu is the white turnip flower: painstakingly cut slices of translucent turnip showcasing the chef’s impeccable knifework; when dipped in the broth, it captures the rich flavours of the soup after a lengthy soak. If large crowds and going out aren’t your thing, The Drunken Pot is the hot pot option for you, because they’ve recently launched a delivery service that brings quality hot pot right to your door. This includes a huge range of ingredients, four soup bases, condiments for your customised dipping sauce, utensils, a pot, a propane burner and even a tablecloth — all the bells and whistles you would expect from a sit-down restaurant — all packed in a convenient recyclable “picnic box”. Select from their carefully curated meal sets, place your order on their website 24 hours in advance and you’re all set. Known to locals as the “hot pot experts”, Him Kee has lived up to the title by enticing customers with its uber fresh meats — namely, the beef brisket clear broth soup with fresh leeks and the Shandong premium marbled beef neck. While not a hot pot dish, we recommend their homemade pan-fried prawn cakes as an appetising nibble while waiting for the soup to bubble up. For those who dare to challenge their heat tolerance, there is no better pepper-packed joint than San Xi Lou. The southwest Chinese-style restaurant is most known for its spicy broth base, made with an overload of blistering green chilis, plus fresh and dried Sichuan peppercorns guaranteeing a tingling and numbing mala experience. And if that doesn’t quite scratch the spice itch, the restaurant also serves signature dishes native to the region like stewed spicy fish/beef and sautéed chicken with red chilli, which can be prepared as dangerously spicy as you desire.